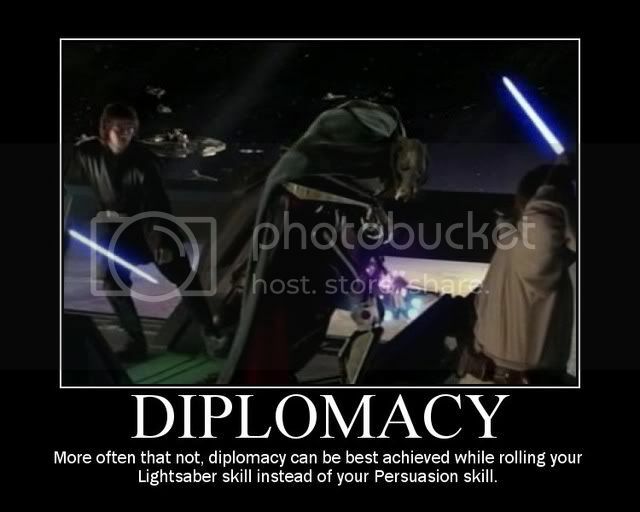 What can you do with Diplomacy? It allows you to alter the reaction of another living creature. It also replaces gather information in pathfinder. It is very important to realize that this exact skill (though with a better bell curve implementation of it) has been in the game for over 30 years, making it crucial to the way the game plays. It is necessary to have a DM independent method of determining the reactions of non-player characters and monsters. The problem comes from this being a skill - the original table served as a tool to determine monster reactions - the vast majority of which were neutral or uncertain. A certain rare number would automatically attack, and rarer still would be helpful. This was one of the most powerful uses of charisma in the older games, the other being allowed henchmen once second level - extra first level fighters are nothing to sneeze at. The die roll being a bell curve allowed charisma to have a powerful influence on the result making a much greater percentage of monsters helpful then they would be otherwise. This skill contains a subtle conceptual difference from earlier editions. In earlier editions this roll was used to determine the monster reaction. In modern editions the monster reaction is pre-decided and this roll influences the monster reaction. This roll is one of the core elements of Dungeons and Dragons. There is an encounter, and for every encounter a 'reaction' is rolled for. Many people ignore or house rule this - but it is a core element of game play on par with Armor Class and To Hit rolls on d20s. The problem is with this not being tied to the power of charisma and instead built into a skill it allows power gaming the system, how so? At 10th level a summoner could have (10 ranks, +5 Charisma, +5 magic item, +2 spell buff, +3 class bonus, +6 feat bonus) 31 ranks in bluff allowing him on a roll of 1 to turn hostile creatures to unfriendly and on a roll of 4 to shift it to indifferent the maximum allowable shift. This could literally provide a way to overcome every single combat encounter - simply diplomance them away. You could of course do the suggestion most people make when you talk about the problem with the skills - create situations to specifically neutralize the skill, but it's pretty clear why that's an unacceptable solution. EDIT: I've reviewed Rich Burlew's diplomacy skills and he's identified several problems and proposed some D20 solutions. He notes the roll being too easy, the indeterminate nature of the target like a master wizard being influenced the same as a potato farmer, the lack of any sort of definition of what the terms such as 'friendly' and 'indifferent' mean, the results of the check being vague, and the lack of any sort of failure. His solutions include adding two sets of modifiers and clarifying the results of success more quantitatively. This is creating a whole new subsystem, but continuing to use the D20. Although I'm not a fan of the randomness curve, this is a potential solution to this conundrum. We gain a D20 compatible method for determining monster reactions. We need a monster reaction solution for this game - I just don't know that a player skill is the way to go. Diplomacy can turn into a skill tax skill. It isn't used to determine monster reactions, only influence them, and it's possible to break an old school type game by level 10, which is two through four levels past when it normally breaks anyway. I think that this would be better handled by it not being a skill. I have no problem with someone being skilled in diplomatic relations giving them a flat one or two bonus to a bell curve roll to influence monster reactions. But as a skill tax skill, I don't really see the benefit. I always thought of an charisma check (not a reaction roll) as a save vs. gaffe. Or, your character is less of a doofus than you are. Really, I think I just feel about Diplomacy the same way I feel about Bluff. It should be handled in a more complex way, integrated into an NPC interaction system which covers diplomacy, bluff, intimidate, etc. With the reaction system, you roll to determine the monster's attitude, and you roleplay the situation from there. The roll is an influence on the gameplay. With the diplomacy skill, you roleplay the situation, then you make a skill roll to see how you influence the monster, with bonuses or penalties from your roleplaying. The gameplay is reduced to an influence on the roll. How is that not an example of backwards priorities? Which of the two is the more enjoyable activity, and should have the most importance assigned to it? In my own personal crusade against the skill subsystem, I adapted Rich Burlew's revision of the skill. I only roll for a negotiations that have any sort of doubt. Using the relationship factor and rewards vs risk modifiers to determine a DC and players succeed with a charisma check. I don't make higher level characters or wiser characters harder to negotiate with just because, but they usually do require more reward. It is not always applicable, some characters are just too infuriated to listen, especially in the middle of battle (Though sometimes it's worth a shot). No one is going to risk something for nothing, that's just crazy. And sometimes, information should be taken at face value and not have to be rolled for, I mean who makes their players roll for "directions to someplace that is not secret" (an example Rich Burlew gives)? The player skill is figuring out who is willing and what to offer in exchange, not how great they are at words or socialization. Sometimes those two can be wishy washy, and a roll is the way to go.